I have shared many different organic yoga wear companies with you lately but today let me introduce you to Inner Waves Organic. What sets Inner Waves apart from the competition is their attention to detail. 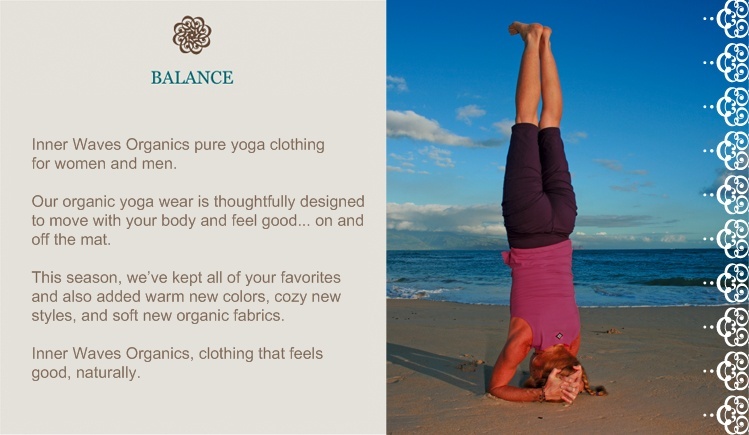 They are a small, family-run company that produces all of their organic yoga wear in the United States. Two huge pluses in my book! All of the fabrics that are used to create the wonderful pieces of Inner Waves clothing is made specifically for their company and no other. How cool is that? 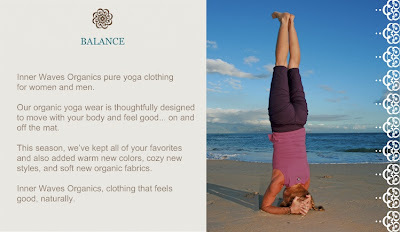 Because all of the workmanship takes place in the US their prices are a little higher than other company's organic yoga wear but to me, buying US is worth it! I chose to review their Moana Capri. I am so happy that I chose this capri. It is tight and easy to move in thanks in part to the little bit of Lycra that is used to ease in mobility. The bottom of the capri came just at my knee which, to me, is the perfect length! Sometimes, when I am doing triangle pose I have a hard time with the fit of my pants. If they are too loose then my hand doesn't stay put on my ankle and when they are perfect, so is my pose. 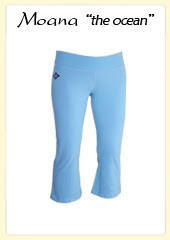 These capris are not only the right length but also the perfect yoga pants. There are 7 colors to choose from but I chose black since it will go with more tops! Some of my favorite tops of theirs include the Wahine tank, and the Lokahi Jacket. Inner Waves best seller happens to be the Moana Pant. It comes in 9 color choices and is also made from the finest organic cotton! These would be perfect for a nice run on the beach or for practicing yoga poses. They retail for $68 but today you have the chance to win a pair. Consider it my early Earth Month kick off. What I would like for you to do is head over to Inner Waves and do one of two things. First, tell me one fact that you learned on their website. Let me give you a hint, the Organic section is full of awesome facts and second, tell me what you favorite item is other than one I talked about. This contest will end on April 28th at NOON EST. Good Luck! It is open to US and Canadian entrants! I JUST signed up for the gym specifically to take their yoga/pilates classes :) Perfect timing! I learned that the clothing is designed and made in the US, and that they use the finest organic and sustainable fibers. I think the idea of responsibility for the earth fits right in with a yoga mindset. I also like the Luana pants! From the Inner Waves website I learned that a non-organic t-shirt may have been produced using 7 tsps. of synthetic fertilizer. A good reason to start buying organic clothing! I like the Mahana Hoodie. I originally found your website by doing a search on Yahoo for giveaway blogs. Conventionally grown cotton is one of the earth's most heavily sprayed crops and is one of the greatest users of synthetic fertilizers. I like the Luana Pants. MAJOR EFFECT OF CONVENTIONALLY GROWN COTTON - Contamination of ground water, polluting wells and drinking water. I like the Lokahi Jacket. FARM WORKERS have the highest rate of chemical-related illness of any occupational group in the U.S. I learned that 14 MILLION people in the U.S. may be exposed to herbicides through contaminated drinking water... Yikes! I like the Kahe skirt in Maui Rose! Entered the Livie and Luca giveaway. Entered the Safety 1st Car Seat giveaway. Entered the Tidy Books giveaway. Entered the Happy Green Bee giveaway. I learned that: You may be surprised to learn that conventionally grown cotton is one of the earth's most heavily sprayed crops and is one of the greatest users of synthetic fertilizers. I also like the Kahe skirt. learned that growing conventionally growing cotton causes contamination of ground water, pollution of wells and drinking water, Sterilization of soil and Air contamination! I learned that conventionally grown cotton is one of the earth's most heavily sprayed crops and is one of the greatest users of synthetic fertilizers. learned that the clothing is designed and made in the US and they are ORGANIC!! fact: 14 MILLION people in the U.S. may be exposed to herbicides through contaminated drinking water. found your site through twitter! entered int he EO giveaway. I learned that 14 million people in the US may have been contaminated y herbicides through contaminated drinking water. I really like the Pono Capris as well. I learned that besides organically grown cotton...hemp, tencel and bamboo are positive sustainable alternatives. I also like Wahine Tank. Thanks. Found your site when another blogger blogged about one of your great giveaways. Found you most likely via a giveaway linky - can't really remember, it's been too long! I learned that they use fine organic cottons, environmentally safe dyes and responsible production practices. I like the Lani Top in Coco Brown. Found out about your site from a link on another blog over a year ago. Entered your Original Sprout giveaway. I learned that 14 MILLION people in the U.S. may be exposed to herbicides through contaminated drinking water. I like the Lokahi Pants in lava black. I learned that Inner Waves clothing is produced in the US, and I like the Mohala top. I'm been following your blog via google feed reader for while, I've probably found you via twitter or online sweepstakes. Conventional cotton is one of the most heavily sprayed crops & I like the maha top.